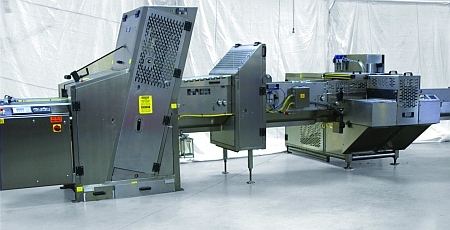 US company United Bakery Equipment is set to launch a campaign to raise its UK food industry profile in conjunction with its UK partner, Midlands-based equipment agent and consultant Habwood Technical Solutions. The moves follows the highly successful installation of a high performance UBE band slicer at a leading UK bread bakery. Dr Wallin went on: 'UBE's band slicers set the benchmark for continuous feed bread slicing machines and already exports them to bakers and food manufacturers in over 40 countries. The market leading 90-75 band slicer provides smooth, even slicing and is ideal for the British market. 'Slices are smooth and uniform because the 90-75 moves loaves through the blades at a slower penetration rate. Loaves enter the blades in a continuous line, not at intervals as in conventional “flight feed” systems. 'This continuous flow means 80 per cent more useful slicing time so a slow blade speed is possible. Hence the smooth accurate slices and it also means that blades last much longer. Plus, having a continuous infeed system rather than a conventional system ensures crippling jam-ups are avoided. The lightweight slice thickness adjuster can easily be removed or put back in less than five minutes. This easy accessibility means that the slicer is easy to clean and maintain. CS aerotherm is leading manufacturer of a range of Temperature and Humidity controlled equipment for a variety of applications in varied industries such as engineering, pharmaceuticals, and bakery equipments.